Police officer lightly wounded in an apparent car attack near Shiloh, by Arab driver who refused to stop and ran into security checkpoint. An apparent car terror attack took place on late Wednesday morning, as a police officer was lightly wounded by an Arab driver near Shiloh in Samaria. The attack took place at the British Police Junction in the Binyamin region of Samaria north of Jerusalem. In the incident, the Arab driver refused orders to stop for a security check and ran into a Border Police checkpoint, lightly wounding the officer. The Arab driver then got out of his car and fled on foot to the adjacent Arab village of Silwad. Magen David Adom (MDA) medical teams arrived on site to provide treatment for the wounded man, who apparently will not require further medical attention. Among the four high-level terror attacks that occurred on Tuesday, a car attack took place and a Jewish man was murdered in a rock ambush attack after being run over by an Arab truck, in what is suspected to be a premeditated attack. 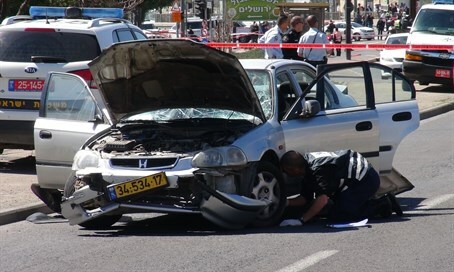 Two Jews were wounded on Tuesday by an Arab terrorist who ran them over at Gush Etzion Junction, before getting out of the car with a knife and being shot dead by IDF soldiers. That attack was preceded by the murder of 55-year-old Avraham Hasno of Kiryat Arba, who was killed in a rock ambush attack. Likewise there were two stabbings that took place in the Hevron area on Tuesday. In one case, a soldier in Hevron was stabbed by an Arab terrorist and lightly to moderately wounded while patrolling near the Hevron Hills village of Beit Awwa. His attacker was shot dead by soldiers. In the second incident on Tuesday night, two IDF soldiers were attacked by two knife-wielding Arab terrorists in Hevron. One was lightly wounded, before the second soldier opened fire and eliminated the two terrorists.